Melatonin is secreted from the pineal gland deep inside the brain. For more than a quarter-century, scientists have been intrigued by melatonin’s ability to coordinate the body’s physiological rhythms that help set the brain’s biological clock. The principal factor affecting melatonin is light, which inhibits the secretion of this hormone. Darkness has the opposite effect from light, resulting in signaling to the pineal gland to increase melatonin secretion. The normal cycles of melatonin production are altered due to factors including aging, medications, and light exposure at night. While the long-term health effects of disrupted melatonin secretion are not yet fully known, some scientists have suggested that years of working nights could lead to adverse effects—even cancer. Melatonin supplements can safely and effectively restore balance to the body’s circadian rhythm of this important hormone, thus helping achieve a restful night’s sleep and keeping your biological clock ticking throughout a long life span. Obtaining sufficient amounts of quality sleep is absolutely necessity for good health, yet many of us experience sleep difficulties on occasion. Insomnia occurs due to a variety of factors—ranging from long hours of work or travel to sleep-disruptive conditions, such as urinary frequency and stressful events. Elderly adults may be particularly susceptible to difficulty sleeping and nighttime awakenings, due to the decline in melatonin levels associated with aging. Melatonin can help promote healthy sleep patterns in some people, regardless of the cause of insomnia. A large analysis revealed several of melatonin’s sleep-enhancing benefits. Reviewing 15 studies of sleep in healthy adults, scientists noted that melatonin administration significantly reduced sleep latency (the amount of time needed to fall asleep), while boosting sleep efficiency (the percentage of time in bed spent asleep) and increasing total sleep duration. Men with benign prostatic enlargement often experience poor sleep due to nighttime urinary frequency. Scientists from the United Kingdom found that melatonin may offer an effective solution. When 20 older men were treated with 2 mg of melatonin each day for one month, they experienced a significant decrease in nighttime urination, and reported that their condition was less bothersome than before treatment. Individuals who work the night shift are often chronically tired due to difficulty falling asleep during the daytime. Supplementing with melatonin has helped improve the length and quality of daytime sleep in these individuals. These findings demonstrate an important characteristic of melatonin: the hormone exerts its sleep inducing and anxiety relieving effects, regardless of dosage time. Traveling to different time zones often leads to the fatigue and insomnia known as jet lag. Supplementing with melatonin can help prevent or reduce jet lag, particularly when traveling across several time zones. Melatonin works by helping re-synchronize the body’s circadian rhythms, helping the traveler adapt to the local time. A promising study suggests that migraine sufferers may be able to reduce the frequency and severity of their headaches by using melatonin. Researchers gave 34 migraine sufferers (29 women and 5 men) a 3-mg dose of melatonin, 30 minutes before bedtime, for three months. Of the 32 patients who finished the study, more than two thirds experienced at least a 50% reduction in number of headaches per month. Additionally, the intensity and duration of headaches decreased. The scientists believe that melatonin’s anti-inflammatory effect and free-radical-scavenging effects contribute to its headache-relieving benefits. One of melatonin’s most important applications is in fighting a wide array of cancers, including breast and liver cancers, non-small-cell lung cancer, and brain metastases from solid tumors. Emerging research suggests that melatonin may help fight one of the most common malignancies in aging men—prostate cancer. In the laboratory, scientists treated androgen-sensitive and androgen-insensitive prostate cancer cells with pharmacological concentrations of melatonin. Treatment with melatonin dramatically reduced the number of prostate cancer cells, while the remaining cells displayed signs of slowed replication and increased differentiation—characteristics of healthy, non-cancerous cells. Melatonin may thus hold promise against prostate cancers, whether they are hormone-sensitive or hormone-insensitive. Scientists conducted a meta-analysis of 10 randomized, controlled trials examining melatonin’s effects (alone or as an adjuvant treatment) on patients with various types of cancer. Supplementation with melatonin reduced the relative risk of death at one year by an impressive 34%—regardless of the type of cancer or the melatonin dosage. Importantly, no adverse effects were reported. 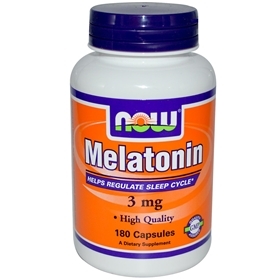 A factor in restorative sleep, melatonin’s benefits include neuroprotection and fighting cancer. Its powerful antioxidant effect offers important enhancements to the brain and nervous system, helping protect against age-related damage. Most exciting are melatonin’s benefits for cancer patients—relieving anxiety and improving survival from an array of cancers. Finally, migraine sufferers using melatonin may enjoy a vast decline in the frequency and severity of their headaches. Suggested Usage: As a dietary supplement, take one capsule near bedtime with water. Capsule may be opened and the contents divided over several evenings if desired. Consider taking this product in combination with NOW® True Calm™ and 5-HTP.